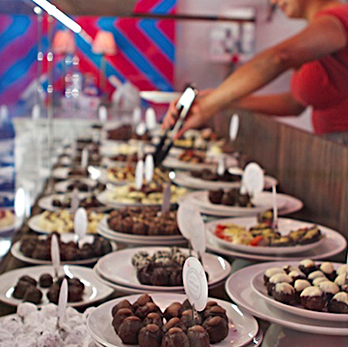 There’s been an explosion of chocolate shops and cafés around SFBA in the past few years. It’s not yet on the level of Paris in terms of quantity, but we think SFBA can compete on quality. In fact, we put together a series of do-it-yourself chocolate tours around the cities and neighborhoods here so you can see these exciting developments for yourself. We CBTB chocolateers research local chocolate and use our blog to share the ones that we are passionate about. From this list, we’ve grouped local artisan chocolatiers, chocolate cafés, retail shops that sell local chocolate, and other chocolate attractions by location. We invite you to try some of these tours for yourself, and see why we think SFBA is Paris’s rival in the chocolate world. We first presented this list as a 50-minute presentation at the 2014 San Francisco International Chocolate Salon. If you have a group that would be interested in having us present this information live, please contact us. Comments to this site are moderated before being posted. Please do not submit your comment twice. It will appear shortly.